Click here to select which present to send to your loved one this Christmas. Forget about the socks, chocolates and scented candles. Give somebody the most Christmassy present of all – a baby born safely. Christmas always reminds us of the miracle of birth, but in rural Malawi, birth is a lot more dangerous than it is here. A woman in Malawi is 60 times more likely to die having a baby than a woman in the UK, and an infant is ten times more likely to lose their life. Living with HIV makes pregnancy even more dangerous. It doesn't take much to hugely improve the chances of a safe birth for mum and baby - support from a local Mother Buddy can make all the difference to a family's birth story, like it did for Noel and Tikhani, whose story is below. So instead of spending money on an ordinary present, why not give somebody a gift that could save a life this Christmas? 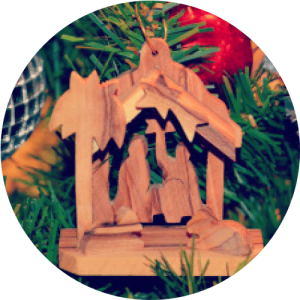 This lovely little olive wood nativity scene has been carved from Bethlehem olive wood and depicts a simple scene of the Christmas birth. Perfect to sit on your table, windowsill, mantlepiece or to hang from your Christmas tree. £15.00 – Along with a personalised card, we’ll send your loved one the beautiful Christmas tree decoration seen below, made in Bethlehem, to remind them of the child born safely thanks to this gift. A £10 donation to the Pregnancy Twinning programme will be made on their behalf to support a mum and baby through a safe delivery. £45.00 – Sponsor a pregnancy! If you want to send someone a really special present (maybe clubbing together with others), you can help to save the life of a mother as well as her baby. For £45, a Mother Buddy can provide wraparound care to a mum-to-be in Malawi throughout pregnancy and after the birth, making sure that she and her whole family stay safe and healthy. Your loved one will receive the Christmas tree decoration below, a personalised card and a Pregnancy Twinning certificate including a photo and details of a woman helped by the Pregnancy Twinning programme. 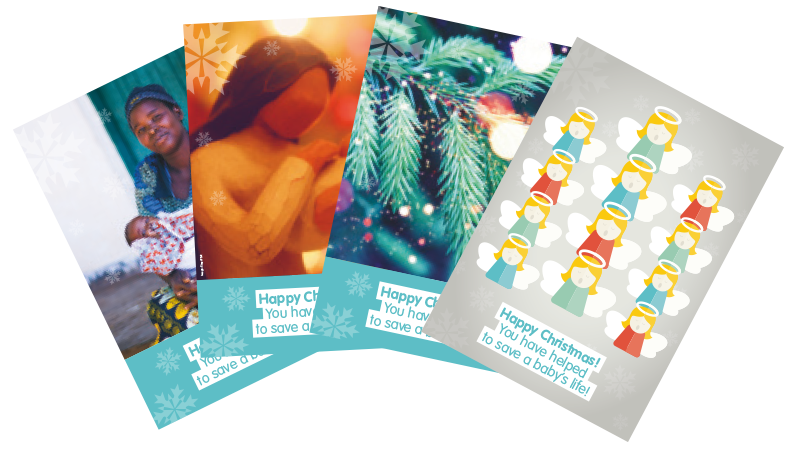 £10.00 – You can send a personalised Christmas card to your friend or family member, without the nativity decoration, which explains where their Christmas gift has gone and the difference it will make. A £7 donation to the Pregnancy Twinning programme will be made on their behalf to support a mum and baby through a safe delivery. Noel and Tikhani had already suffered four miscarriages when Lilian, a Mother Buddy, came to support them during their fifth pregnancy. She encouraged them to go to the antenatal clinic this time and to be tested for HIV, as this increases the risk of pregnancy problems. They found they were both HIV positive, and assumed that they would not have a healthy child. But Lilian explained what to do. On her advice, Noel and Tikhani both started taking anti-retroviral medicines, ate a balanced diet, and went to four antenatal appointments together. Finally, the miracle happened when Tikhani gave birth to baby MacDonald, safely at the local clinic – and he tested negative for HIV! One of the reasons why children are dying from AIDS-related causes is that antiretroviral medicines are not available in child-friendly formulations. Chasing Zero supports the StopAids campaign on ‘Missing medicines.’ Add your voice to the Campaign.